Oklahoma Johnny Hale was scootering around the record-setting WSOP-Seniors event last night once they got down to about nine tables … he was splashing pots with $5 commemorative chips from Palace Station honoring members of “The Seniors” Poker Player Hall of Fame. 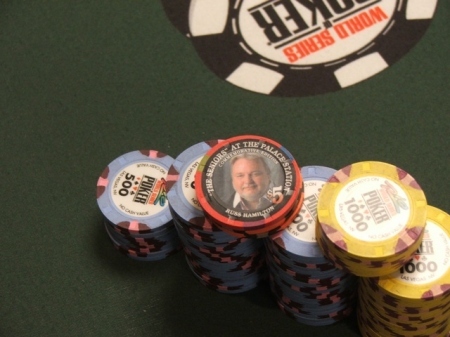 The chip plausibly stimulating additional action on the table I happened to be watching bore a familiar mug … none other than disgraced poker pioneer Russ Hamilton, which presumably could make for quite the collector’s item. 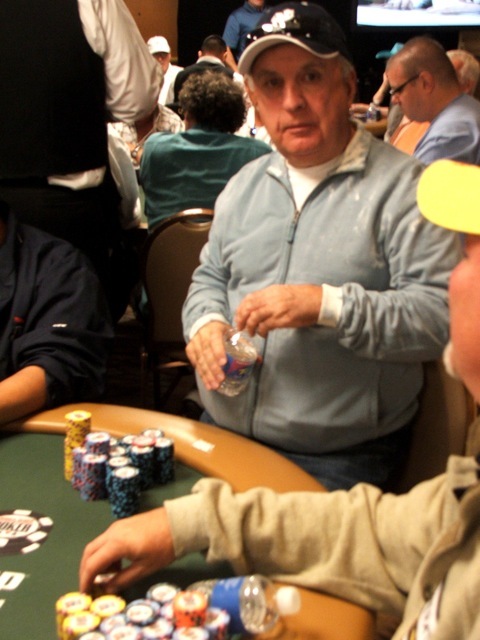 Jack Ward has only seen his fortunes in the WSOP-Seniors event improve since taking down the pot with a Russ Hamilton Hall of Fame overlay. The winner of that pot, btw, and the hotly desired piece of poker memorabilia, was Jack Ward, from Gulfport, Miss. Not all the Johnny Hale splash pots happened to feature Russ Hamilton chips … there were also some Vince Burgios, Johnny Moss’s, TJ Cloutiers, and others. But since taking down the Hamilton coin, Ward jumped from about 50k in chips to 519k, which had him on the verge of elimination in Day 2 starting Day 3, today, in 7th position with 23 players remaining. En route, Ward also happened to take out Berry Johnston, a current member of the Seniors Hall of Fame, who lasted longest amongst that group and finished in 39th place. UPDATE: At this moment there are currently 13 left, with Team Pokerati’s Tom Schneider out in 14th, and newfound fan favorite Jack Ward in 10th. You can follow the chip-for-chip action here. Meanwhile, Wicked Chops seem to be getting onto the multi-part longform-narrative bandwagon, perhaps realizing that’s the really the only way to tell the full story of the biggest poker cheating scam in history, and possibly a multibillion-dollar black eye to an online poker industry still struggling for legitimacy. While it seems like Wicked Chops may be putting together something more akin to the Warren Report while Haley nails down the dirty details of Umbrella Man, it seems clear that before all is said and done with Cereus, we’ll be looking at a true-crime aga of online poker shenanigans that goes far beyond any one man on a single chip playing dirty.